The R'n'R brothers back together. After years on the road divided in different projects all over the world, the two musicians joined again in 2007: an acoustic duo was born to let the guys play what lies in the bottom of their hearts. 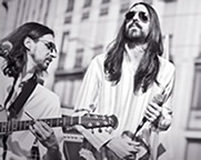 Joe Sal on vocals and percussions and Ettore Salati on stringed instruments and backing vocals perform the best of '60 and '70 rock, celebrating the Woodstock people, the Flower Power generation and the British Invasion and bring these faboulous songs on stage in acoustic versions. So, is this a cover duo fit for lounge audiences? Of course it's not! The energy that lies inside this music express itself even without drums, without large sound systems, even without electric power...! Joe and Ettore play with passion and strength and their performances are always regarded as if they were an electric band. The choice to play acoustic has another reason: the most important is to arrange the songs differently, even in an unusual way, and then to offer a new vision of this music, also by using various stringed instruments. In fact, there is plenty of them: 6 and 12 string guitars, sitar, dobro guitar, cigar box dulcimer, lapsteel, mandolin, irish bouzouki, banjo guitar, balalaika... a peculiarity of SaltyBros is also to add an "ethnic" flavour to the music they usually play. SaltyBros have performed in several different venues and festivals, always receiving enthusiastic feedbacks, and after some years on the road, they decided to witness these experiences producing a studio album. So finally "A Chest Of Goldies" is released; the attempt was to catch the intensity of their live performances, and the challenge was won! More information are available at the webpage "The Album".